Mukhya Mantri yuva Udyami Yojana is to provide employment to the people of the state. The scheme is started by the government of Madhya Pradesh. As per the scheme the people of the state can set up small industries. The government will provide the financial assistance to the people for the functioning of the scheme. As under the scheme the candidate can get the loan amount of a loan of Rs 10 lakh to Rs 1 crore. It will help to generate the employment in the state for the youth. The main objective of this scheme is to give the financial assistance to entrepreneurs to provide and generate more jobs in the state. Check the Objectives of the Yuva Udyami Yojana are as follows. The people who are resident of the Madhya Pradesh can avail the benefit of the Yojana. The candidate can invest for the business of Rs. 10 lakhs to 1 crore rupees. The youth can invest for the industry as well as for the services. The assistance of Rs. 12 lakhs is also given for the capital cost for the project under the Yojana. The interest rate of 5% on the project’s capital cost for 7 years subsidy will be available. Unemployed Youth will get the benefit of employment. The condition for the Eligibility to apply for the Madhya Pradesh Yuva Udyami are as follows. As mentioned above the candidate should be the resident the state Madhya Pradesh. The age of the candidate should be 18 and 40 years. The minimum qualification which is required is Class 10th for registration for the scheme. The applicant who are bank defaulter cannot access the benefit of the scheme. Contender who are already obtaining benefit of the other state or center scheme are not eligible for the scheme. Only the use of the scheme can be made for the setting up of industry business. The financial help which can be availed under the scheme is as follows. The applicant of the BPL / SC / ST / OBC / Other Backward Classes / Female / Minority 30% (maximum Rs 2 lakhs) will be payable. For the project’s capital cost Margin Money Assistance of 15% (maximum 12 lakhs) will be payable. The subsidy for the interest rate of 5% for 7 years for the project’s capital cost. Under the yojana the guarantee charges has to paid at the rate prevailing for the period of 7 years. Online application for the scheme can be made. Register yourself. Get the login id and password. Then fill the application form to obtain the benefit. You can also apply offline by attaining the application form from the official site. Mudra Yojana se kya abhipre h? The government inorder to expand the business of small enterprises started the Mudra Yojana. The scheme aims the welfare of the people of the country. As the name it self named so to fund the unfunded people. Scheme was launched by the PM of India Narendra modi. It will help the struggling small business man to get the access bank, Loans and the insurances. People or the business man can get the advantage in the following three condition. They have set up the three types of loans which are available under the scheme. People who want to get the less funds for their business set up. Rs 50,000 under this stage can be achieved under the shishu Loan. Candidate who want to get the financial assistance or loan of Rs 50,000 to Rs 5 Lakh. These type of loan are allocated to the people who have set up the business and wants to expand the business or improvement. It will help such type of people. Contender or enterprises can make loan access or financial help of loan from Rs 5 Lakh and up to Rs 10 lakh. The eligibility for the Mudra Loan is as follows. Candidate should be the resident of India. Small or Micro Businesses are eligible to get the benefit of the Loan under the scheme. The NCSBS Non corporate small business segments can be in urban and rural areas. Note- woman entrepreneur can also avail loan under various type of the Shishu, Kishor, and Tarun as under the MUDRA Scheme. Mudra loan ke liye apko nimen likht dastawage dene hoge. Identity Proof of the candidate i.e Aadhaar card, Voter card, PAN card, Driving Licence or Passport. Proof of Residence i.e Domicile certificate, Bills of the either electricity or water, Ration card. Caste Certificate of the applicant. Address and identity proof of the company. If you have any of the loan in the name of the company then you have to give the 2 years projection of your balance sheet. In case you want to get the machinery for company then you have to give the details of the supplier. Mudra loan yojana ke tehat apko kitna vyaz dena hoga? Shishu loan upto Rs 50,000 interest rate of 10% to 12 %. Kishor loan upto Rs 5 Lakh interest rate applicable is between 14% to 17 %. Tarun loan upto Rs 10 lakh you have to pay the interest starting from 16% but it varies from one bank to another. Mukhyamantri Amrutam Yojana is started by the government of Gujarat. Under the scheme, the details of the cashless medical benefit will be given to the people of the state. The scheme Ma Amrutam is tertiary health coverage for the people of the state. The scheme was launched on September 4, 2012. No paperwork is required to get the benefit of the scheme. International Society for quality in healthcare will approve the hospitals for the functionally of the scheme. The scheme will benefit of Rs. 3 lakh per family. The state government will also give Rs.300 as the transport fee for getting treatment for Junk Hospital. The scheme is basically for the BPL families and after that, the scheme would be open for the families whose annual income from all the sources is less than Rs 3.00 lakh. You have to fulfill the points of eligibility as follows. 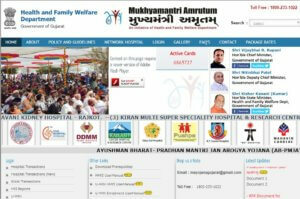 Check if you are eligible for the Maa Amrutam Scheme Gujarat. The candidate who belongs to Below the poverty line can apply. Contenders whose name is in the BPL List. State and center government will prepare the list. The annual income of the family is less than Rs.2.50 Lac. Rural and Asha are eligible. The cashless Ma Amrutam Yojana is fully funded by the Gujarat government. Following are the diseases which are to cured under the scheme. Renal (Kidney) Issues and Obligations. Families can claim for the fund in case of the following diseases. Check the list of the documents. You have to bring the documents to get the benefit of the scheme. If you are interested to apply. The best part of the scheme is that the concerned or designated officer will decide the eligibility of the candidate and name would appear in the list. As the candidate who is eligible for the scheme. Get the list as a name will appear in the list. Then only you would be able to get benefit under the scheme. Taluka and Civic Center for the enrollment under the scheme. Then the MA/MAV Card will be allocated to the eligible candidates. In order to get the benefit of the scheme, the candidate has to bring the MA/, MAV card along with to the hospital. As the information of the hospitals empaneled under the scheme is available at the official site. Candidates can also make use of it to know about the hospital to get the treatment. Goa Government has started the Deen Dayal Swasthya Sewa Yojana for the welfare of the people of the state. It is a health insurance scheme. The people who are the permanent resident of the state Goa. The scheme is aimed to give the benefit to each resident of the state and not depending on the financial status of the families. Deen Dayal Swasthya Sewa Yojana of the Goa state will benefit the members of the family. You would be delighted to know that the insurance of Rs. 2.5 Lakh for the three members of the family. In case of four members or more will get the benefit of 4 Lakh. Deen Dayal Swasthya Sewa Yojana will be applicable at all the private and Government hospitals. 447 types of investigations and other services will be covered under the scheme. 147 diseases are given treatment under the Deen Dayal Swasthya Sewa Yojana. The government will pay an amount of Rs. 3,206 per family to the insurance agencies annual installment for the scheme implementation to provide the benefit. There is no such hard and fast rules which are set for the eligibility for the Deen Dayal Swasthya Sewa Yojana. As there is only one major rule that the candidate should be the permanent resident of the Goa State. The candidate should be living there for more than 5 years. And no other rules for the Deen Dayal Swasthya Sewa Scheme. Note – Families in which any of the member is either state or center government employ are not covered for the scheme. You can apply by visiting the official site of the Deen Dayal Swasthya Sewa Yojana. You would be able to get the list for the people who are eligible under the scheme at the official site. The enrollment center has been set by the Goa Government. They are 17 in number.You can visit the center to get enrolled for the scheme to attain the benefit of the scheme. You can apply for the scheme if you pay the service charges as the registration fee. Check the following points to know about the scheme charges. 50% discount is available for the reserved classes applicant. As under the scheme after the enrollment at the center the candidate will be issued the Deen Dayal Swasthya Sewa Yojana card. You can make use of the card to get treatment by visiting any of the private or government hospital in Goa. If you are Interested to get more about the scheme then you can make use of the helpline number as follows for the DDSSY.